As we enter the home stretch for the Storefront Library at 640 Washington St, Boston Street Lab is running evaluation interviews with staff and patrons. 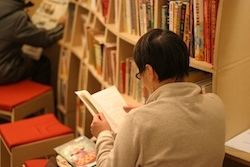 A frequent theme emerging from these discussions is the unique role of the Storefront Library as a safe, engaging social space where patrons can linger. For example, we’re hearing that the Storefront Library is a preferred meeting location for friends going out, because you can read a book, visit the Drawing Lab, or join a program underway while waiting for your companions to show up. Alternatively, some patrons simply drop in after work or school before heading home for dinner, usually for newspapers or internet access. Others of you have discovered that we’re open late on Thursday and that we have a collection of donated board games. And everyone knows that you can sit and read anytime, without have to buy a cup of coffee, or shop, (or pretend to shop). Third places is a term used by urban sociologist Ray Oldenburg referring to a type of social space lying between home and work—the two places where we generally spend most of our time. Importantly, third places can provide an opportunity for creative interaction and civic engagement on a level playing field. Here are a few links exploring the concept in relation to libraries (and coffee shops) from bloggers in Boston (MA) and Maricopa County (AZ). We’re inspired by the concept of third places, but, as any librarian, cafe owner , or postmaster will tell you: the devil is in the details. Right now, Boston Street Lab is analyzing quantitative and qualitative data about how people use the Storefront Library. Our goal: uncover and document how to lower costs, reduce risk, remove operational impediments while simultaneously improving guest experience, raising program attendance, and increasing positive community impacts. We think a rigorous evaluation of this temporary project can inform and inspire advocacy for a permanent library branch in the neighborhood. We also think it will help Boston Street Lab and other producers seeking to develop other street-level cultural and civic uses of space in urban neighborhoods. Sam-I was literally JUST (an hour ago) thinking about the concept of “third place” and wishing that I had a place that served that function for me (it would actually be a “second place” in my case, as I am a stay-at-home mom). Back before there were public libraries (the first of which opened in your fair city in 1859! ), there were “social libraries” that were a refuge from the responsibilities (and pressures) of work and home, where people could read and also socialize and relax. A kind of private, personal library on a grand public scale. A combination of B&N and Starbucks with all of the commerce involved removed. Storefront Library has brought back the social library, a concept that came about as young men of the 19th century moved to big cities and lived in cramped quarters and thus needed a “third place” to call their own. Things haven’t changed too much in a century and a half- I live in cramped quarters in a big city. The need for a third place lives on. Great piece, I never thought about it in quite that way– but after spending time in the library in Chinatown, I definitely saw how patron’s were using it as their “third place”. I love that you’ll be looking for a winning formula so that the concept of “third places” can be made into realities across many cities.